The lecture, held last Wednesday at the Jackman Humanities building, was crowded, leaving many attendees sitting on the floor or leaning against a wall. This lecture is part of the #callresponse exhibition currently on display at UTM’s Blackwood Gallery. It is an artistic collaboration between artists and respondents. The process began with five local art commissions by Indigenous female artists. The artists were then asked to ‘call’ a viewer to respond to the work. Both the artists’ calls and the viewers’ ‘responses’ are included in the exhibition. The #callresponse exhibition features work from Christi Belcourt, Isaac Murdoch, Maria Hupfield, IV Castellanos, Esther Neff, Ursula Johnson, Cheryl L’Hirondelle, Tanya Willard, Marcia Crosby, Laakkuluk Williamson Bathory, and Tania Tagaq. In total, #callresponse is comprised of 12 artworks, nine of which are displayed at the Blackwood Gallery, with others exhibiting at the e|gallery and Bernie Miller Lightbox. Five of the works from the Blackwood Gallery’s Inuit prints collection also hang on the second floor of the UTM library. The subject of the art varies. Willard’s “Intergenerational effects (I found these in the BUSH),” for instance, references the dark history of substance abuse and residential schools in Indigenous communities. Willard’s work features two glass Listerine bottles containing blue seed beads and a rolled-up picture inside each of them. One picture shows children ready to be transported to residential schools on the back of pickup trucks, while another depicts the windows of the Basilica of Saint Sabina, a historical church in Rome. This piece might seem quaint until the onlooker realizes the depth of pain and trauma to which it speaks. 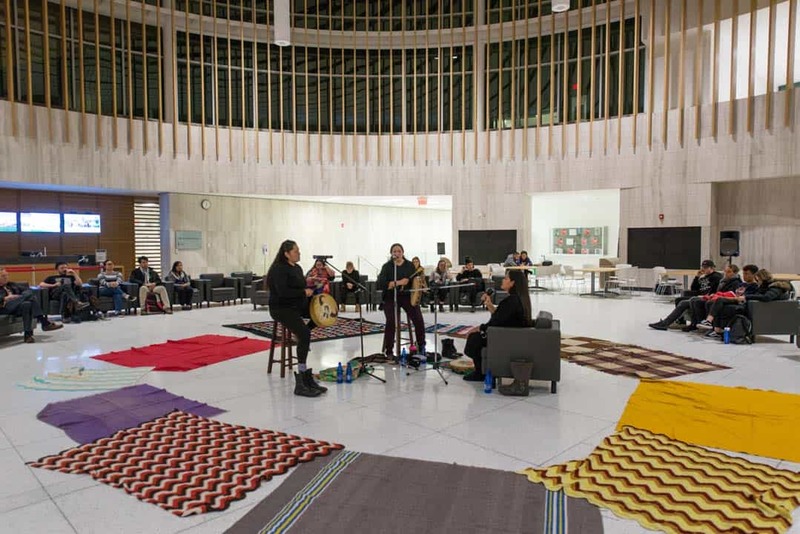 The #callresponse exhibition is part of Stewardship, the fourth exhibition or ‘circuit’ of Take Care, a five-part series of exhibitions, performances, and workshops organized by the Blackwood Gallery at UTM. Take Care aims to confront the crisis of care through mobilizing more than 100 artists, activists, curators, and researchers. The series is curated by Letters & Handshakes, a collaboration between Dr. Greg de Peuter of Wilfrid Laurier University and UTM’s Dr. Christine Shaw. Another key part of the #callresponse exhibition are public programs, such as lectures and panel discussions, which help to further the discussion produced by the works of art. During her lecture, Simpson touched on how it feels to exist on lands shaped by theft, both of labour and land. She highlighted statistics that show the comparative political disempowerment of Indigenous populations: over 400 years after colonization began, Indigenous people now own only two per cent of their lands. She also spoke at length about the title of ‘town-destroyer’ that has been bestowed upon American presidents. George Washington, the first President of the United States, inherited this title from his great-grandfather, who destroyed Piscataway villages in present day Virginia. Washington, in turn, ordered the Solomon Expedition during the Revolutionary War — a campaign that destroyed up to 40 Iroquois villages in New York. “The President… in the new settler nation earned a name that operates as a title conferred upon him — that of town destroyer. He too has a name and a structure that he inhabits, and it is an adaptation to the new worlds. That structure remains in spite of who actually inhabits it,” explained Simpson. Simpson also addressed what she called “the killing kind of kindness” shown by Prime Minister Trudeau, referred to as the ‘pipeline-supporting’ prime minister. #callresponse will run at the Blackwood Gallery until January 27, 2018.